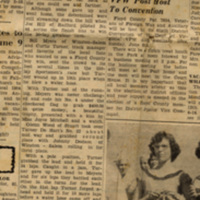 Floyd Press, June 3, 1954, pp. 1 and 5. Copyrighted material—for Virginia Tech educational use only. 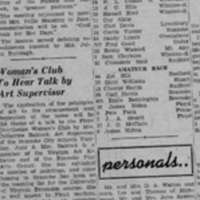 Floyd Press, “Huge Crowd Attends First Races at Floyd Speedway; Bill Meyers Wins Sportsmen's, Joe Hill Cops Amateur,” Virginia Tech Digital Humanities Omeka, accessed April 25, 2019, http://dhomeka.lib.vt.edu/items/show/26.